You might have used your friends pc or the one at the cyber when you were away from your home. You might have surfed internet as well. Now the problem is that if you’re using Internet explorer in some other pc you won’t have the same bookmarks, settings, passwords and other settings that you had in your pc. This can be really annoying and backing up favorites or passwords manually can involve a lot of time and effort. 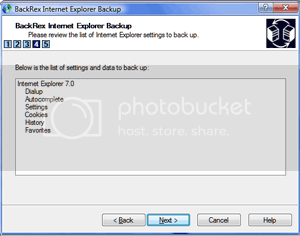 To make things easier there’s an application known as BackRex Internet Explorer Backup. BackRex Internet Explorer Backup is a backup and restore tool for Internet Explorer. It allows you to backup favorites, history, proxy settings, fonts, dialup accounts, auto complete passwords and cookies. It can help you to move all your Internet Explorer settings from one computer to another. The best part is that even if there’s a different version installed on the other pc, you can still import these settings. Sounds cool isn’t it? You can also use the scheduled backup feature to backup your data on a regular basis – daily, weekly or monthly.